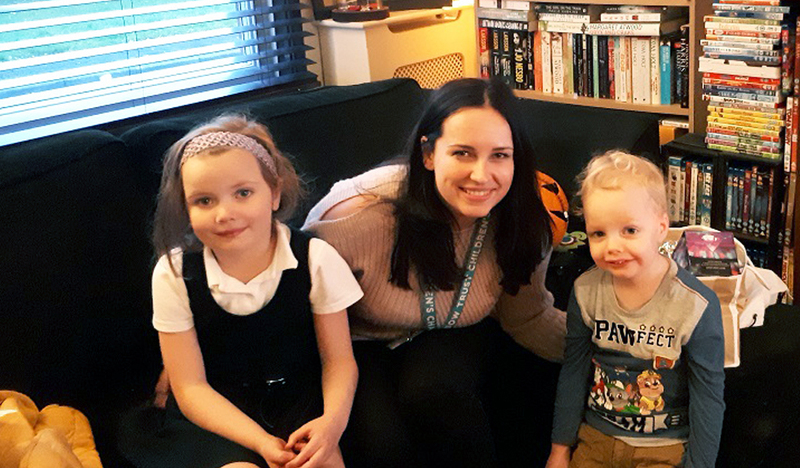 A Manchester family who we support, has spoken about the joy its Family Support Worker has brought them, ahead of International Day of Happiness on 20 March. Every Tuesday, three-year-old Alexander Taylor sits by the window of his Bolton home looking out for Family Support Worker Brodie, who supports the whole family because Alexander’s twin brother Noel has severe development delay after developing a brain injury at birth and is on constant oxygen. Our expert Family Support Workers enable families who have a child with a life threatening illness to make the most of their time together by helping them at home, in hospital and in the community, for as long as is needed. As Brodie arrives at the Taylor family home, armed with toys and games to play with Alexander, Noel and their six-year-old sister Abigail, Alexander’s face breaks into a smile and Noel squeals excitedly, clearly pleased to see her. Rainbow Trust has been supporting the Taylor family for two years and Dad Darren said Rainbow Trust and Brodie had made a huge difference to their lives, supporting the whole family and providing an outlet for the children and some much needed respite for Darren and his wife Isobel. “Every Tuesday if Brodie’s not coming it’s sadness and meltdown,” Darren said. Darren said Brodie has made the family happier. He spoke out just weeks before International Day of Happiness, which celebrates people in the community who bring happiness to others as part of a global campaign comprising 193 United Nations member states who have adopted a resolution calling for happiness to be given a greater priority. “Without a doubt Brodie has brought happiness to us,” Darren said. When she comes she brings games and activities for the kids. There are lots of times when we are doing activities with the kids and there’s always the chance during that activity that I’ll have to turn my hand to Noel if he might need medical attention. “When Brodie’s here it’s full on two hours of fun and games and it makes us happier. It’s unfair on the kids. They do understand but they need that attention on them for a little bit. They are children and they are crying out for attention. During Brodie’s visits, she spends time with Alexander and Noel and takes Alexander to collect big sister Abigail from school to give Darren, Noel’s full time carer, some respite. She plays games and does arts and crafts with them and uses sensory toys to stimulate them. This frees up time for Darren to either spend with Noel or to catch up on some household chores. “We would really struggle without Brodie,” Darren said. “Collecting Abigail from school should be a five-minute job but getting Noel ready and in his wheelchair is an hour’s operation. I do that at least three times a week so to have the extra time when Brodie is here is great because it enables me to get on. I would be so far behind without it and the kids have something stimulating to look forward to with Brodie. “It sounds a small thing but in my world and the children’s world that makes a great difference. It gives them something to look forward to. Every three months nurses have to visit Noel at home to administer IV medication three times a day over a two-week period. “Alexander and Abigail are crying out for attention and when Brodie’s here they can play because she’s here for them and it’s uninterrupted time. “We are a very close family and we make sure we deal with it together but sometimes Abigail will go to school and she realises that her friends aren’t in a similar situation. It’s all Alexander has known but Isobel and I know that there are families out there with different lives. It’s tough for Isobel and I and Brodie is such a friendly, approachable and good person, well everybody we have met at Rainbow Trust is. The Taylors spend as much family together as possible and have enjoyed drop in groups and activity and sibling days organised by Rainbow Trust, giving the parents the opportunity to meet other families with seriously ill children and the children the chance to interact and enjoy sensory activities. After another motivating game of Monopoly with Abigail and colouring with Alexander, Brodie packs up the toys and prepares to leave for another week and the children settle down to watch some tv while Darren plays with Noel. Alexander and Abigail are looking forward to a half-term trip to the bowling alley and Wacky Warehouse with Brodie. “We love Rainbow Trust in general and Brodie,” Darren said.